The semi-hollow AS83 features maple top, back, and sides, and handsome ivory binding on the body, headstock, and fingerboard. An expertly crafted 3pc Maple/ Mahogany set-in neck ensures body liveliness and is fitted with a rich Ebony fretboard with silky contrasting pearl block inlays. The tortoise shell colored pickguard provides an gorgeous appearance. The Ibanez-original Quik Change III tailpiece enables fast and easy string changing. 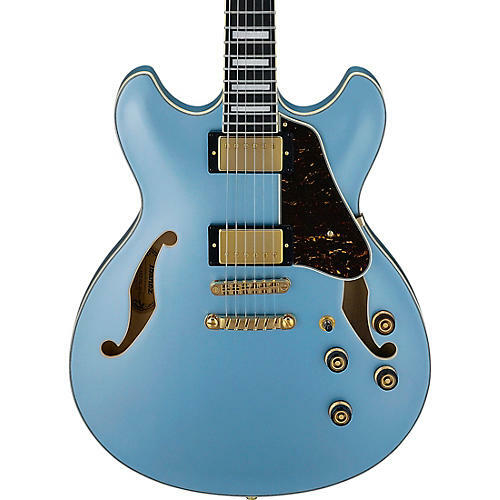 Jazz fans will recognize the Ibanez original Super 58 Custom pickups - the preferred pickup of George Benson, Pat Metheny, and John Scofield used in their own signature models. These pickups provide warm, balanced articulation, and excellent response. Super 58's are at home in variety of genres.